An estimated 8.5 billion tons of poultry feathers are produced from farms globally every year, in addition to the tons of human hair that is extracted from wastewater treatment facilities worldwide. Keratinase is a serine protease that primarily attacks the disulfide bonds in keratin waste—such as feathers and hair. The expression of bacterial keratinase provides an opportunity to manage this degradation-resistant keratin waste. This study aims to provide a foundation for future management of hair and feather waste by reducing the negative effects that the current treatment methods have on the environment and by producing a useful amino acid protein product of high quality, such as animal feed and fertilizers. This is done through a semi-quantitative analysis of keratinase A (kerA) and keratinase US (kerUS) activity and expression of these genes in Escherichia coli. The genes for production of kerA and kerUS originate from Bacillus licheniformis and Bacillus brevis, respectively. These genes were optimized for expression in E. coli JM109 and DH5⍺. The kerA enzyme is most active in degrading keratin in feathers, while KerUS is most active in degrading keratin in hair. The production and effectiveness of keratinase was tested on human hair over five days at a temperature of 37°C. Observations from this semi-quantitative assay, combined with results from a skim milk plate assay suggest that some protease is being expressed and secreted. Keywords: Keratinase, Escherichia coli, keratin degradation, keratin, human hair, poultry feathers, environmental engineering, wastewater treatment. Authors are listed in alphabetical order. Luc Arvisais and Jessica Puurunen mentored the group. Please direct all correspondence to larvisais@redeemer.ab.ca. Each year, an estimated 8.5 billion tons of poultry feathers are produced from farms globally (New Solution Found to Disposal of Feathers 2009), in addition to the human hair that is extracted from waste treatment facilities worldwide. In the Canadian town of Canmore, the accumulation of hair in wastewater treatment plants’ machinery has formed hard-to-remove tangles and has resulted in the blockage of pumps and pipes. Both waste products are made of a very strong protein called keratin. Keratin is difficult to degrade due to its low chemical reactivity and resistance to common proteases (Gupta 2014). There are currently three methods for dealing with keratin waste: incineration, dumping in landfills, and transforming the keratin into a useful protein product. However, none of these solutions are ethically responsible. The first method of keratin waste management is incineration. Incineration leads to the release of pollutants into the atmosphere, causing foul odours and contributing to harmful runoff, which negatively impacts the surrounding and downstream areas—including harming livestock and nearby ecosystems (Gupta 2014). The industrial method to address keratin waste involves discarding and burying it in landfills. The resulting leachate increases the nitrogen concentration in surrounding areas, leading to algal blooms and harming the ecosystem (Gupta 2014). The third method to dispose of keratin waste is mechanically breaking it down into useful products. This process dries the waste and crushes it for later processing into useful products (Jaouadi et al. 2013). The technology for processing keratin into useful products (e.g., animal feed, fertilizer) is currently underdeveloped (Jaouadi et al. 2013). The current processes used are time consuming, harmful to the environment, and create only low quality and ineffective products through mechanical degradation of the protein. The keratin-processing byproducts are under investigation and largely unknown. Research suggests they contain a high concentration of amino acids. Thus, keratin degradation into amino acids via keratinases can possibly yield high quality products, while having negligible environmental impact (Satyanarayana et al. 2013). Keratinases are serine proteases that break down keratin waste by degrading hydrogen disulfide bonds (Radha and Gunasekaran 2007). Some species of Bacillus, actinomycetes, and fungi have been reported as keratinolytic; and while frequently studied in Bacillus, heterologous expression of keratinase in E. coli is limited (Radha and Gunasekaran 2007). Several species of Bacillus produce keratinases suitable for industrial applications in managing keratin waste, though this option is not industrially viable because of the low level of expression (Hu et al. 2013). Therefore, researchers such as Hu et al. (2013) chose to express kerA into two different conventional vectors—pET30⍺ and pET32⍺—in E. coli, resulting in two different recombinant keratinases. Another study, by Liu et al. (2013) cloned the ker gene using the expression vector pET-22b into E. coli BL21. This study focused on the expression and characterization of keratinase in E. coli, and the determination of optimal pH and temperature for the recombinant keratinase. In contrast to the positive results reported by the previous two reports, Satyanarayana et al. (2013) report that keratinase expression using the kerA gene resulted in low expression, and high expression became lethal for E. coli or accumulated in inactive keratinase as insoluble inclusion bodies. Therefore, in most cases, expression of keratinase in E. coli finds its use in being better industrially suited for degradation of keratin waste than Bacillus. For this study, two keratinase genes, kerA and kerUS, were used. KerA is more suited to the stacked beta pleated sheets of beta-keratin that are found in feathers. KerUS, on the other hand, is more suited to the alpha-keratin found in hair (Cai et al. 2008). Though they both have a wide range of substrate specificity, they would both be suited to degrade beta-keratin or alpha-keratin, but a difference in efficiency might be expected (Satyanarayana et al. 2013). This study aims to semi-quantitatively observe the degradation of keratin in the form of human hair due to KerA and KerUS production. Also included is an analysis of the ability of E. coli to express and secrete both keratinases (KerA and KerUS) through the cloning of the plasmids and subsequent transformation into E. coli for expression. Gene Design. Keratinase gene sequences (kerA from Bacillus licheniformis, and kerUS from Bacillus brevis) were obtained from the National Center for Biotechnology Information (NCBI) gene database. The native signal sequences were removed from both proteins and replaced with pelB signal sequence (BBa_J32015). The gene sequences were placed downstream of an isopropyl β-D-1-thiogalactopyranoside (IPTG) inducible promoter. This was done to create two separate plasmids: one for the kerA gene and one for the kerUS gene. (BBa_R0010), and a ribosome binding site (BBa_J04500). Lastly, the genes were codon optimized for expression in E. coli and synthesized and cloned into a pUC57 plasmid backbone by BIOBASIC Inc. Transformation of E. coli JM109 and DH5⍺. E. coli JM109 and DH5⍺ was made chemically competent according to previously published methods (Alberta Innovates 2014). kerA and kerUS plasmids were added to cells. Cells were incubated on ice for 30 min., followed by heat shock at 42℃ for 60 s, and a second incubation on ice for 5 min. Luria-Bertani (LB) broth was added to the cells, which were incubated at 37℃ for 1 h before plating on LB agar plates containing 100 µg/mL ampicillin (amp). Gel Electrophoresis. E. coli JM109 containing the kerUS plasmid was mini-prepped according to methods previously published using an Omega bio-tek E.Z.N.A. Plasmid DNA Mini Kit (Alberta Innovates 2014). With four kerUS mini-prepped samples, a linearized pGEX vector as positive control, and an AMRESCO DNA ladder, a gel electrophoresis was run according to methods published by Alberta Innovates (2014). Cell Lysis. For lysing the cells, two overnight colonies of KerUS and a control of two DH5⍺ colonies were grown in LB broth. These cultures were diluted 100x in 5 mL LB broth for all eight tubes. 5 µL amp was added to each tube, and half of the tubes received 50 µL IPTG (100 mM), whereas the other half received 50 µL distilled water. The cultures were then incubated for 3.5 h at 37°C. Neither DH5⍺ cultures grew because of an error in adding amp. After incubation, 1.5 mL of each of the kerUS cultures and DH5⍺ undiluted overnight cultures were centrifuged for 2 min. at 7,000 RPM. This last step was repeated twice, for a bigger pellet. To make the lysis buffer, 3.03 g Tris was added and stirred in 500 mL demineralized and deionized water. This was refrigerated for 1 h, and then 0.077 g dithiothreitol (DTT), a reducing agent, was added, as well 0.5 g lysozyme. After adding 60 µL lysis buffer to each cell pellet, the tubes were shaken in the fridge for 30 min. The tubes were frozen in liquid nitrogen and thawed in a 40-42°C water bath two times. They were then centrifuged at 7,000 RPM for 2 min. twice. The pellet had not formed correctly, so 60 µL lysis buffer was added and they were spun again for 2 min. at 7,000 RPM. The supernatants were taken off of the pellets for use in the skim milk plate assay. Skim Milk Plate Assay. The skim milk plates are used to show enzyme activity. As keratinase is an enzyme with a broad substrate specificity, zones of clearing should be seen around cultures grown or supernatant poured on skim milk plates due to keratinase degrading the protein in the skim milk. To make skim milk plates, 125 mL of agar was prepared according to methods published by Alberta Innovates (2014). While autoclaving the 125 mL LB agar for 25 min., 5 g of skim milk powder was dissolved into 125 mL distilled water. As the LB agar cooled, the dissolved milk solution was autoclaved for 10 min. 2.5 µL of amp was added to the LB-agar, then the skim milk solution was poured in and mixed. Plates were poured and should look opaque with no solids. The supernatant from the centrifugation in the cell lysis was saved. The supernatant came from lysing four samples of E. coli DH5⍺ containing the kerUS gene: two that had been induced with IPTG and two that had not. 10 µL of each sample supernatant was pipetted onto a skim milk plate in four separate corners. The plate was placed in the incubator at 37℃ and observed over four days for any zones of clearing in the skim milk. Semiquantitative Hair Degradation Assay. Using 10 mL of sterile LB-broth, two cultures of each E. coli JM109 with the kerA plasmid, with the kerUS plasmid, and without any plasmid, were grown overnight at 37℃. The cultures containing the kerA and kerUS plasmids contained 100 µg/mL of amp; while the cultures without any plasmid, used as a negative control, contained no antibiotics. After 12 h of incubation, the OD600 of each culture was measured before adding IPTG to the media with a final concentration of 1 mM. Human hair was dried at 64℃ for 15 min. until very dry. The hair was then weighed and distributed in 0.05 g aliquots of loose hair to each of the cultures. The cultures were then placed in the incubator at 37℃ with gentle shaking. After 120 h incubation, all tubes were centrifuged at 3,000 RPM for 5 min. to cause hair to pellet, and the supernatant was discarded. After rinsing the remaining hair pellet in 10% bleach, they were dried overnight at 37℃. The very dry hair was then weighed to determine the final mass. Gel Electrophoresis. Shown in Figure 1, bands for the ladder, positive control pGEX vector, and plasmids for all kerUS mini-preps could be seen. As the pGEX vector was linearized, the band was expected to be seen around 5,000 bp, and in the gel it was seen at 5,000 bp. The kerUS plasmids were not linearized, thus there was no expected size at which the bands should be present. Two slightly different bands of DNA can be seen in the wells for kerUS, and they have run the same distance in all four wells. Figure 1. The ladder is seen in the leftmost lane; the band for the pGEX positive appears at around 5,000 bp; the supercoiled conformation of the plasmid is shown in the blue box, and the open circular conformation of the plasmid is shown in the green box. Skim Milk Plate Assay. Zones of clearing in the skim milk plate assay indicate protein degradation, suggesting the presence of keratinase. After two days of incubation, some zones of clearing could be seen around colonies growing from the KerUS Colony 4 IPTG and KerUS Colony 5 Water. This can be seen in Figure 2. 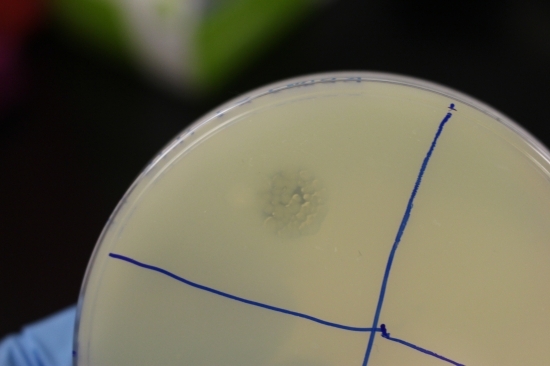 After three days of incubation, the zones of clearing were much bigger around the two bacterial cultures that had grown from the supernatant plated. Some contamination was visible after three days, and this, as well as the zones of clearing, can be seen in Figure 3. Over the five days, zones of clearing had grown in the supernatant from kerUS C4 induced with IPTG, and kerUS C3 not-induced. Figure 3. Larger zones of clearing seen on the fourth day of incubation, as well as some contamination seen close to the colonies. Semiquantitative Hair Degradation Assay. After culturing E. coli containing the kerA, kerUS, and no keratinase plasmid overnight, the OD600 was measured. 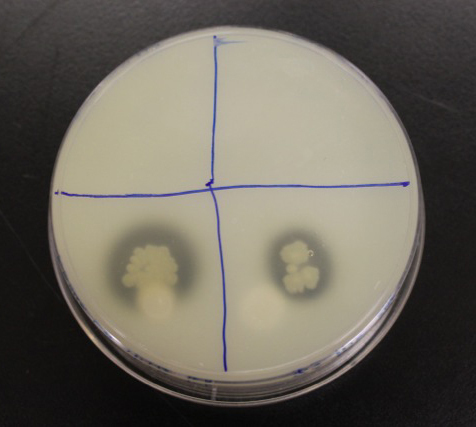 a Two different plated colonies were used in growing to cultures of each. Negligible bacterial growth occurred in either of the cultures containing the KerA expressing bacteria. This suggest KerA is toxic to E. coli. Little growth was observed in one of the cultures lacking the keratinase plasmid. Therefore, the subsequent parts of the assay were conducted using only cultures named: KerUS-colony 1, KerUS-colony 2, and JM109-colony 7. After five days of incubation, the hair was removed from the cultures and weighed again. The mass of hair is recorded in Table 2, and the difference in hair mass is calculated in Table 3. Table 2. 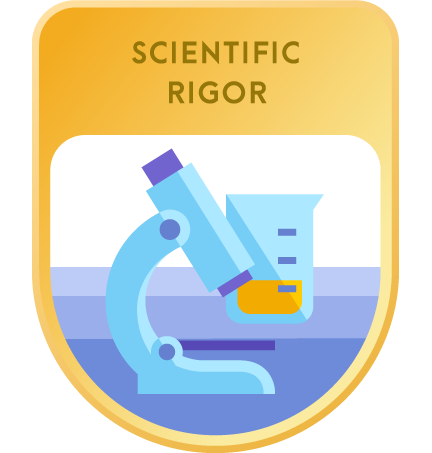 Mass of petri dish used to weigh the hair, mass of petri dish with the dried hair, and the calculated mass of hair from these values. Table 3. Calculated difference between initial and final mass of hair. There was no visible hair degradation—which would appear in the form of sludge. 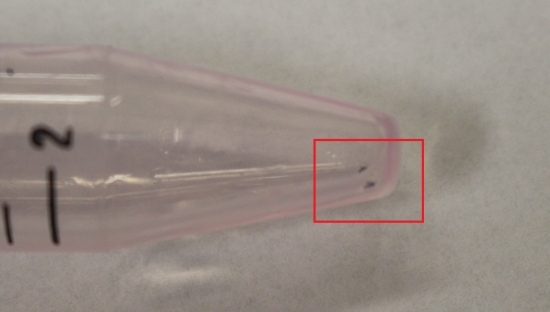 However, some very small black fragments were visible in all culture tubes (see Figure 4). A second observation, this time only from the tubes containing the cultures of E. coli JM109 with the kerUS plasmids, is a colour change. After removing the LB broth and hair, there was a clear pink and slightly purple colour to what was previously clear plastic (see Figure 5). The colour seemed very similar to the colour of the cap on the tube. Figure 4. Example of black fragments seen at the bottom of all culture tubes at the end of the assay. Gene Optimization and Transformation. Miniprep and gel electrophoresis confirms the transformation of the kerUS plasmid. This step was not done to confirm the transformation of kerA plasmids as no culture containing the kerA gene has grown properly (which is elaborated on in the kerA section of the discussion). Therefore, there were not enough cells to miniprep and retrieve plasmid DNA from. 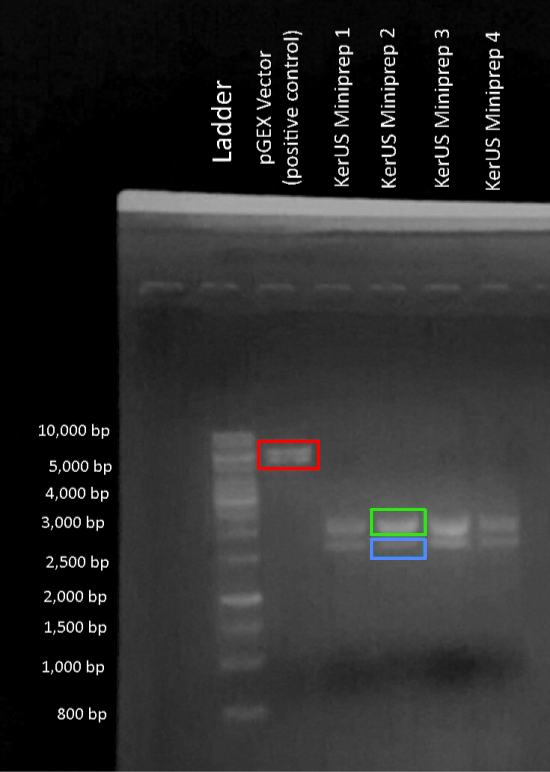 As seen in the results, two bands separated by a small distance were seen in each of the gel wells loaded with mini-prepped kerUS plasmids (Figure 1). The two bands represent the open circular conformation of the plasmid and the supercoiled conformation of the plasmid. This confirms the presence of plasmids within the E. coli cells, indicating that the transformation was successful. kerUS Gene. To test the production of the kerUS enzyme, two experiments were conducted. The first test used a semi-quantitative assay to determine if the construct would break down hair. The second test employed a skim milk plate assay designed to show protein degradation by kerUS. In the first test KerUS was applied to casein protein. Clear patches in skim milk (i.e., clearing) indicate protein degradation. This clearing would demonstrate the efficiency of kerUS as a protease with broad applications to many proteins. The plate containing kerUS C3 with water (non-induced) showed some clearing. More clearing was visible in the section of the plate that contained kerUS C4 (induced) plate. The reason for the clearing from the non-induced supernatant is that the promoter used is not strictly controlled and instead is “leaky.” A second possibility is that the skim milk in the plate could have induced the promoter, because it is a lactose-inducible promoter. However, as a whole, the zones of clearing seen on the plate support that the kerUS gene is being expressed, and kerUS is effective in degrading protein. The reported contamination on the plate appears to be fungus. Though, there is no clearing around the growth and it could be ruled out as a possible reason for the clearing observed around the growing colonies. The second test exposed hair to the keratinase enzyme for an extended period of time. Three of the overnight cultures created were used: KerUS C1, KerUS C2, and JM109 C7. Small black specks, similar in colour to the hair used in the assay, were found at the bottom of all the tubes. The identity of this material is unknown. It may be dirt or a small amount of degraded hair. The colour of both KerUS tubes changed from clear plastics to pink/slightly purple. This colour was similar to the tube’s cap, indicating possible leaching of the cap’s dye into the tube. This could be a result of potential kerUS enzyme activity on a protein-based dye in the plastic, or a potential reaction between kerUS and another agent already in the culture. The JM109 showed negligible colour change in the tube. This indicates the colour change is likely due to keratinase as JM109 served as a negative control and should not be producing any form of Keratinase as it does not contain any kerUS or kerA gene. Some quantitative results were also observed from measuring the before and the after effects of keratinase exposure. A change in hair mass of 0.01 g in KerUS C1 was recorded. However, because of the resolution on the scale, the change in mass is negligible. The literature suggests that maximum keratinolytic activity occurs at around 30 h, and by then, a majority of the hair would be broken down. However, this was not what was observed in this experiment for these strains. Despite this, no difference in hair mass does not necessarily mean that no KerUS is being produced. Reasons for this include insufficient IPTG induction, the formation of inclusion bodies of inactive keratinase. The enzyme activity on the skim milk plate was also quite delayed, taking two days to show any clearing. This suggests that a longer incubation period might be needed to observe hair degradation. Thus, a future improvement to this experiment would be to inoculate cultures, induce them, and grow them for two weeks before weighing the hair. Future experiments should also include consideration of the following factors: of the concentration of kerUS, concentration of hair, mixing, and temperature. kerA Gene. A second keratinase enzyme, KerA, was also tested in this study. But with the same testing, very few results have been observed. Extensive brainstorming, troubleshooting, and hypothesizing has been done to determine why the kerA has been unsuccessful in a lab setting. It is possible that kerA was not expressed due to improper translation. If the gene was improperly translated, then either kerA mutants would be expressed or expression would not occur. Proposed solutions to this problem were the resynthesizing of the plasmid ring with a promoter. A suggested gene to use would be Red Fluorescent Protein (RFP). If the newly synthesized plasmid had an RFP coding region downstream of Ker, fluorescence would provide visible confirmation of Ker expression. Another hypothesis or source of error in the lack of protein expression could be that the amp in the plates and cultures was either not present or the antibiotic that was added had been rendered ineffective, possibly due to heat inactivation. If there was no amp in the plates, then the bacteria that was cultured would not contain the plasmid. There would only be growth shown if there was an amp resistance in the bacteria, found in the keratinase plasmid; and if no amp was present, the bacteria grown does not have the desired expression cassette, which could lead to the lack of hair degradation observed. To address this error, fresh antibiotic stocks and fresh plates would need to be made. The next step would be to reculture and regrow the bacteria with a positive and negative control on the new plates. The positive control would use a gene like RFP, with an amp resistance, to make sure that the bacteria being grown has taken in the plasmids that were intended. Another hypothesis on why the keratinase gene was not being expressed properly is due to problems with the secretion tag. Because the keratinase expression genes come from Bacillus, which are gram positive, and have one cell membrane, expressing the gene in E. coli, a gram negative bacteria requires optimization. Although the plasmids were optimized by changing the codons to those most frequently used in E. coli, adding a pelB export signal sequence to replace the native Bacillus signal sequence, there may have been errors in the optimization, so the E. coli cannot express it and secrete it properly. The keratinase gene may be expressed properly within the cell, but without it being secreted out of the membrane, no protein is exposed to the enzyme. In order to allow the keratinase to be taken out of the cells, one step to take would be lysing the cells to allow for the keratinases to be free floating in the culture and degrade the protein. KerA has also been reported as lethal to E. coli if expressed at a high rate (Satyanarayana et al. 2013). This might account for the low OD600 of the kerA cultures in the hair degradation assay, as the background expression of kerA before IPTG induction could be killing the cells, thus prohibiting cultures to grow. Another promoter that is less “leaky” than the current one would have to be used to solve this problem. The lack of visible hair degradation could be caused by a variety of other factors as well. The most likely explanations would include insufficient IPTG induction or formation of inclusion bodies of inactive keratinase. After further analysis of the lack of protein expression, it was realized that there may be an issue with the promoter. The promoter being used in the research is IPTG inducible, and a different concentration may be required to induce the expression of the keratinase. The concentration of IPTG used to trigger expression of the genes could be too low or too high. If the concentration were too low, then it would not be registered by the promoter region of the plasmid and the gene would not be able to induce expression. On the other hand, if the concentration of IPTG were too high, the toxicity, without the neutralization agent of lactose, would kill the cells anyway. In order to combat these miscalculations, further research must be completed in order to ensure that the concentration of IPTG is correct to express the enzymes. Another potential issue identified was that the conditions in which the bacteria was being stored were not optimal for the growth or survival of the cells or the expression of the keratinase enzyme. This could be due to a number of factors, including the temperature at which they were being stored at or degraded in. If the temperature was too high or too low, not optimal, then this would lead to the denaturation of the enzyme, or a failure of the cells to grow and produce protein optimally. By going through the protocols with different conditions, this would allow for new parameters to be set and different factors to be eliminated through the process of trial and error. However, as no cells are growing, it is not possible to miniprep and run a gel with the kerA plasmid to confirm the transformation. Bioreactor. In order to test the constructs on a larger scale, replicating use in industry, the current plan for implementation is the use of a bioreactor. The design currently is for the use of a constantly aerated bubble design, because it is commonly used in wastewater treatment plants and could easily be integrated within the poultry industry on a large scale. The bioreactor is in the early development stages, as a design has been sketched out and the plan for upcoming months is to construct a fully functional bioreactor. The current design consists of using a 1-3 L Spinner-flask connecting two intravenous (IV) bags, each of which will be filled with growth media attached to the first of the three arms. One of the IV bags will be an acidic pH, and one will have a basic pH to ensure that the bacteria cannot grow back up the tube into the media stocks, clogging it up. When the acidic media and basic media mix in the bioreactor, however, the pH will adjust to allow for cell growth. The top lid will be used as a hatch to let the hair and feathers in, and the third lid will be used as a pressure gauge, with a 0.2 µL filter to ensure that no unwanted materials enter or exit, while still allowing for gas to exit, in order to prevent unwanted pressure build up. Wrapped around the Spinner-flask will be a heating blanket with an exact temperature to keep the bioreactor at a constant temperature of 37°C. It will also have three aerators powered by a water pump outside the Spinner-flask (Figure 6). These aerators will both constantly mix the culture and the waste products as well as introduce air into the bioreactor. At the bottom, there will be an effluent pipe controlled by a tank connector to allow for water to exit, and a filter of sorts for keeping the sludge inside to be cleaned out when the tank is at capacity (Figure 6). A bioreactor would be a good final system for a variety of reasons. 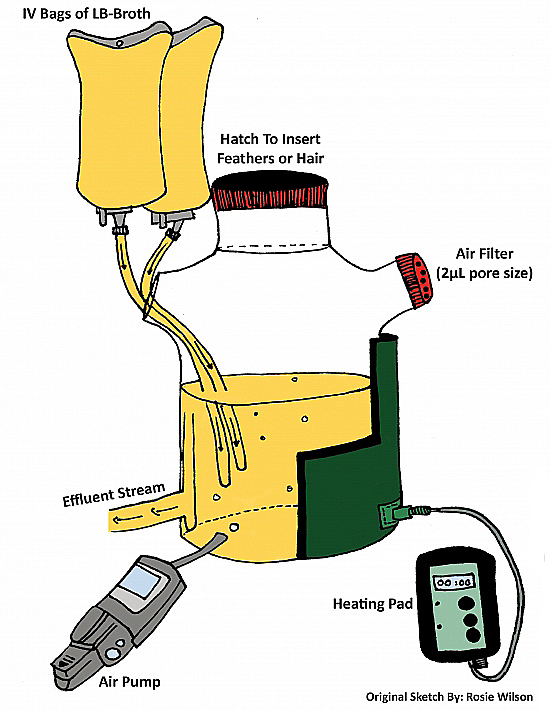 As previously mentioned, it would be easy to implement as many wastewater treatment facilities currently use them and they would be easy to instal in the poultry industry. However, there are many other positives to the use of a bioreactor, one of which is the fact that a bioreactor will keep constant conditions to implement the optimized characteristics into the bioreactor. 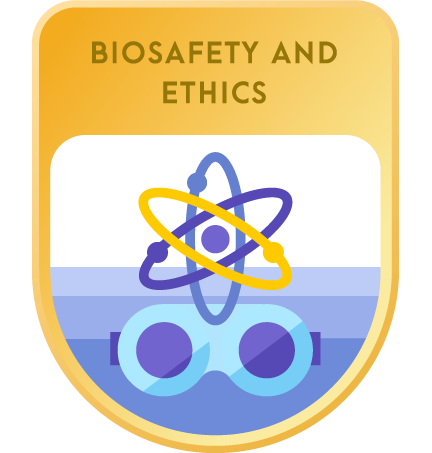 Furthermore, a bioreactor is a relatively safe system for us to use, as it is a sealed containment system that will allow for the keratin waste to enter and the useful keratin protein to exist without contamination taking place and E. coli leaving the system. In the future, to make the safety system more redundant, a safety control at the genetic level in the form of a kill switch would be implemented. Figure 6. First draft bioreactor schematic for the implementation of the project. Some of the design may be altered slightly when built. Original sketch created by Rosie Wilson. Future Goals. 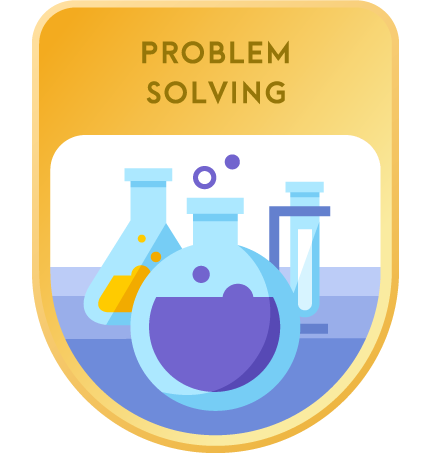 Future goals include finding the true cause and solution to the kerA problem, running further assays to get more quantitative data, optimization, testing for safety of the construct, learning how to deal with the protein product, perfecting the design of the bioreactor, and working on a business plan for the construct as well as the bioreactor system. Through this study, among others, it has been hypothesized that KerA is toxic to E. coli cells in high expression. However, at this point this is no conclusive data to why KerA has been unsuccessful. In the future, there will be troubleshooting for ideas to come to a conclusion as to why the KerA has been unsuccessful and how to fix the problem. One current hypothesis that could prevent the protein killing the cells when transcribed would be to use a different promoter within the construct. Using an inducible promoter that is tightly regulated, where expression can be completely induced or turned off, would allow for the expression to only occur after the cells have grown, limiting the time that the protein has to kill the cell. One specific promoter that could be used would be an arabinose promoter (http://parts.igem.org/PBAD_Promoter_Family). This would allow the expression to only be induced when the cells have grown, limiting the time that the protein can kill the cells before expression. The next process would be lysing the cell to remove the protein expressed. The next steps to be taken include running further semi-quantitative hair degradation assays and gathering more quantitative data to gather more results about the rate and the effectiveness of the keratinase enzymes. By performing the assays, more information will be gathered to learn whether the lack of expression is due to toxicity of the protein or from other errors that could occur. Once the construct has been proven successful through assays, more tests will be performed to determine the optimal conditions for enzyme productivity, such as pH, temperature, and amount of air needed. Another important part of the research to be done is looking into how well the byproduct from the degradation can be used as useful product in animal feeds and fertilizers. This research would largely help in the implementation of the construct within the bioreactor, because the bioreactor would contain the construct and maintain all of the optimal conditions, allowing for the correct rates of growth and expression, as well as ways to dispose of the byproducts. In a few years time, once the construct has been successfully created, characterized, and tested for safety, the final development for real world implementation will begin. This process will include making it so that the implementation within industries is both accessible and functional, by developing a sustainable business plan that can be used to distribute the product to make it readily available in both industries. The future plans for this project are broad and cover a variety of research plans and ideas. This future planning is important for achieving the end goal of developing a successful enzyme product. Conclusion. Keratinase enzymes can be used to break down keratin—a very strong protein found in the waste products of both hair and feathers—into its basic amino acids, which can be used to create a useful protein produce that can be utilized in products such as fertilizer or animal feed (Satyanarayana et al. 2013). This study attempted to express two keratinase enzymes; KerA and KerUS in E. coli. The constructs were tested using two experiments. The first was the use of a skim milk plate test to see if the keratinase enzymes are being actively expressed and breaking down protein. This test was set up by making skim milk agar plates and then pipetting the supernatant from KerUS directly onto the plate. The test demonstrated the presence of the KerUS enzyme, as there was visible clearing within the protein on the skim milk plates. This confirmed that the KerUS enzyme was successfully breaking down protein. The second test was a semi-quantitative assay that was used to observe the degradation of hair under what was predicted to be the optimal conditions for enzymatic expression. This test was performed by placing hair in two falcon tubes with the KerUS enzyme present, which had been induced with IPTG to make it produce the keratinase enzyme. It was then left in an incubator for five days. Some observations that were made included the darkening in colour of the LB broth, the settling of black particles in the tubes, and the observable change in the colour of the falcon tube itself from a clear plastic colour to a somewhat purple colour. The cause for this change in colour has yet to be investigated at length. Some hypotheses have been developed, the main hypothesis is concerning the so-called “bleeding” of the lid colour into the clear plastic of the falcon tube. The prediction made was that the enzyme affected the plastic and started to degrade the colour of the lid. This “bleeding” in colour would have lead to a change in the colour of the falcon tube. With both experiments, the KerA enzyme was not tested, as there was no substantial growth in the KerA cultures so no test could be successfully performed. Through the experiments conducted, the results demonstrate that though kerUS appears to be breaking down proteins, there is no growth of the KerA transformed cultures. The lack of results observed for the kerA assays could be due to a multitude of reasons, which have been hypothesized but not proven. The first hypothesis is that the KerA was not being expressed due to improper translation in the gene. The second hypothesis is that the amp in the plates and cultures was either not present or the antibiotic that was added had been rendered ineffective. The third hypothesis has to do with the secretion tag. An explanation for why the semi-quantitative assay was unsuccessful could have to do with the fact that a longer incubation time was required for degradation to occur. Though, some other reasons why the test was unsuccessful have been hypothesized. The most likely explanations for this lack of positive results could include insufficient IPTG induction, formation of inclusion bodies of inactive keratinase, an issue with the protein expression linked to the optimization of the gene from Bacillus, or an issue with the promoter. Another potential issue identified was the conditions in which the bacteria is being stored, as they were not optimal for the growth or survival of the cells and the expression of the keratinase enzyme. In summary, this research is centered around the development of two keratinase enzymes that can be used to break down keratin waste into a useful protein product in both an environmentally and ethically responsible way. By developing this project, it is possible to engineer bacteria to degrade hair and feathers, solving the 8.5 billion ton problem that is keratin waste,s well as degrading the keratin protein more efficiently and finding an efficient use for the waste created. The Our Lady of the Snows iGEM team would like to thank everyone who has been there for our team over the past three years and those who continue to support us in our endeavours. Firstly, we would like to thank our teacher supervisors Mr. Luc Arvisais and Mrs. Jessica Puurunen for all they have done in sacrificing their spare time to help us develop and learn. We could not have done this without them and are extremely grateful to have them as teachers and role models. We would also like to thank our mentors, particularly our current mentors, David Lloyd and Lisa Oberding for helping us to develop our project and meet our goals. We would also like to thank our previous mentor Dr. Magda Pop, who has helped us over the past three years in developing our project, our lab skills, and knowledge of synbio. 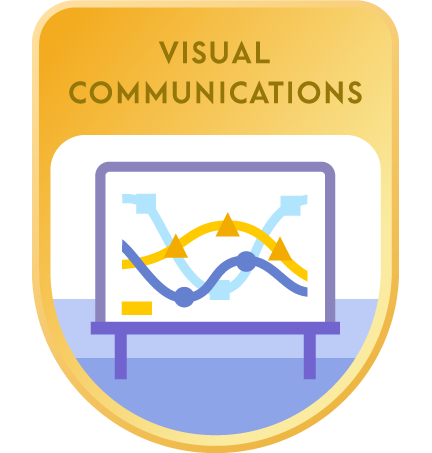 All your help has been invaluable, and we are extremely grateful to have such amazing professionals working with us inside and outside of the lab. A very big thank you to Mindfuel and Geekstarter for supporting us this year! As well as Geekstarter for the support over the previous two years. Finally, the Breakers would like to thank our parents, school, sponsors, and community. Without your continued support, our team would not be able to do what we love and for this we are very grateful. This program has given us so much more than what we could ever have imagined, and we will never regret the sleepless nights or long days in the lab we were able to spend on this project! Cai CG, Lou BG, Zheng XD. Keratinase production and keratin degradation by a mutant strain of Bacillus subtilis. J Zhejiang Univ Sci B. 2008 Jan;9(1):60-7. Gupta A. Human Hair “Waste” and Its Utilization: Gaps and Possibilities. Journal of Waste Management [Internet]. 27 April 2014. [cited 2016 May 18];2014. Available from: http://bit.ly/2ekTRev. Hu H, He J, Yu B, Ping Z, et al. Expression of a keratinase (kerA) gene from Bacillus licheniformis in Escherichia coli and characterization of the recombinant enzymes. Biotechnol Lett. 2013 Feb;35(2):239-44. Jaouadi NZ, Rekik H, Badis A, et al. Biochemical and Molecular Characterization of a Serine Keratinase from Brevibacillus brevis US575 with Promising Keratin-Biodegradation and Hide-Dehairing Activities. PLoS One. 2013 Oct 11;8(10):e76722. Liu B, Zhnag J, Fang Z, et al. Expression, Characterization and Fermentation optimization of Keratinase from Bacillus licheniformis in Escherichia coli. Chin J Appl Environ Biol. 2013;19(6):997-1002. Radha S, Gunasekaran P. Cloning and expression of keratinase gene in Bacillus megaterium and optimization of fermentation conditions for the production of keratinase by recombinant strain. J Appl Microbiol. 2007 Oct;103(4):1301-10. Synthetic biology guidebook: for iGEM high school [Internet]. Edmonton, Alberta, Canada: Alberta Innovates-Technology Futures; c2014 [cited 2016 May 18]. 170 p. Available from: http://bit.ly/2eceKIt.